First time to Jakarta? Wondering about Indonesia airport? No idea how to get from Jakarta airport to city without getting scammed? Don’t worry, I will explain (hopefully everything that you need to know). So before we start, you need to know that there are two airports in Jakarta; Soekarno Hatta, which was the only commercial airport and Halim Perdana Kusuma, which was an airport that doesn’t have any commercial flights, but since January 2014 it does. If you come to Jakarta from outside Indonesia, you will arrive in Terminal 2 or 3 of Soekarno Hatta Airport (The airport’s IATA code, CGK, originates from Cengkareng, a district northwest of the city, and it is often called Cengkareng Airport by Indonesians, although the airport is administratively located within Tangerang). As many tourists use Air Asia to fly within Indonesia, there is a good chance that you will arrive in the new Terminal 3 (this is the terminal for Air Asia Indonesia domestic flights). The same is true if you fly with Garuda Indonesia, the national airline, which operates domestic and international flights out of Terminal 3. If you take an Indonesian airlines like Sriwijaya Air, Lion Air, or Xpress Air you will arrive in Terminal 1 or Terminal 2. Jakarta Airport is very big, and it got a shiny new Terminal 3 in 2016, but it is nevertheless very crowded. After passing through immigration and collecting all of your luggage, you will exit the terminal. Chances are people touts will notice that you are a tourist because of your bags. There are a lot of different ways that you can get from the airport to Jakarta. The easiest and most convenient is arranging a Jakarta car rental (which I can help arrange). There’s a full list of other transport options below. Jakarta traffic is bad. Whatever form of transport you’re taking expect to spend time stuck in a traffic jam. My record was 3.5 hours stuck in a taxi. I expect to spend at least 90 minutes stuck in the traffic (to be safe give yourself at least 90 minutes, preferably 2 hours) for the ride from Jakarta to the airport. If you’re transiting through Jakarta or spending only one night in the city I’d recommend choosing a hotel near Jakarta Airport. The best budget hotel near Jakarta airport is Ibis Budget Jakarta. For mid-range I recommend Jakarta Airport Hotel. It was recently refurbished, such a good thing, and is at Terminal 2 (just wakeup and get on your flight). The only luxury hotel near the airport is Sheraton Bandara (a bit dated compare to luxury hotels in the city). For a single traveller you should check the Digital Airport Hotel, it is located in Terminal 3 Ultimate and it is a capsule hotel. They have the option for 6 hours rental, which is a great offer for a traveller who are looking to have a sort rest before or after a flight. One other thing… I can almost guarantee that the unofficial taxi driver or tout will say “do you want to go to Jalan Jaksa?” This is because they already have the mindset that most foreign travellers are backpackers that will be heading to Jaksa. Whatever they say, just be polite, smile a bit and ignore them. They will follow you and try their best to get you to come with them, but what ever they say, don’t trust them. The government of Jakarta has recently completed the process of building a high speed rail link from the airport to the centre of the city. The airport train opened in December 2017 and has proved a hit with locals and tourists alike so far. The train will stop at Soekarno-Hatta, Batuceper (BPR) , Sudirman Baru/Stasiun BNI City (BNC), and Bekasi stations. Later on they probably add Duri and Manggarai. Be aware that, while trains run for most of the day, they are not 24-hour. From Soekarno-Hatta Airport (BST) the first train is at 06:20 am, and the last one is at 11:20 pm. From Sudirman Baru (BNI), the first train departs at 3:21 am, and the last one at 10:51 pm. It takes around an hour to ride from Sudirman Baru/Stasiun BNI City (BNC) to the airport. Tickets cost Rp70,000 (airport to Sudirman Baru; price/person one way) and can be bought at the station or via the Railink App, or online here. For a comparison, from Sudirman Baru to the airport, if you are taking a taxi, the journey will take around 1,5 hour (moderate traffic), with cost around Rp 150,000. I’ll write this on the assumption that you want to go to Jaksa, which is in central Jakarta ;), which is a 90 minute journey. With this in mind, here are two options I would recommend to get from Soekarno Hatta Aiport to Jakarta. The first option is to go by taxi, which will cost you around Rp. 150,000 – Rp. 200,000 (Taxi argometer starts at Rp. 7,500). I would suggest take a Blue Bird (blue color), Express (white color), Taxiku (yellow color) or Gamya Taxi (green color), as they are the most trusted taxi companies. Everyone knows this, so you will probably have to queue. You can easily spot the taxi counter outside the airport building. By the way, if you are a group of 4, I would suggest splitting the cost of a taxi rather than taking a bus. The other option you have, which is the cheapest option is to use the Damri bus, which will cost Rp40,000 (please see picture at the end of the article). I think the last Damri bus to Jakarta is around 00:30 am. You want to take the one that going to Gambir (Gambir is a train station). The first bus from Gambir to the airport is at 3:00 am (3am-9pm; every 30 minutes or 1 hour). It’s easy to find the Damri ticketing station in each of the airport terminals. Simply tell them that you want a ticket to Gambir and then wait. Usually they will yell “Gambir… Gambir…” when your bus is coming, but just be sure to keep on eye on every Damri bus that comes. The sign of the destination is on the front of the bus, either on the top middle or bottom left side of the front big window. From Gambir, you can walk to Jaksa (it is not far at all!) or you can get an ojek (motorbike taxi) for $2-3. – There is a luggage storage area at the airport. At terminal 3 Ultimate, it is located at the very end (from the arrival). The name is .Box and the rates is per kg: 0-10kg (small): IDR 50,000 / day. There are should also be in other terminals. Arriving in a new city can be so stressful. I hope this guide gives you the information you needed to know to get from Jakarta Airport to the city (if I missed anything leave me a note in the comments below and I’ll update the post). There’s some more articles below about Jakarta you might find useful. That should keep you busy. Hope you enjoy your time in the city. And if you need more information about Indonesia just use the search box or pick the topic from the menu at the top (we’ve got hundreds of useful articles about the country). Enjoy your time in Indonesia. Have you ever been to Jakarta’s airport and to the city? What was your experience? Tomorrow will be my first time arriving in Jakarta alone and I shall go for this Damri adventure! Secretly, of course. My mother would flip if she knows. Thanks for the “tutorial”! Wish me all the best! I speak somewhat lancer bahasa Indo so shouldn’t be a problem… right? Believe it or not, I just got to read your reply now! Well, it’s been months but I’ll never forget my virgin Damri experience which was only possible because of your helpful guide 🙂 It was easy to find the Damri station although it was quite a walk away and I had to reject hundreds of touting taxi/pickup services along the way. I took the Damri to Gambir station and took a taxi to my exact destination from there. The taxi driver did try to cheat me, but I told them I know it doesn’t cost Rp.100,000 to get to Kuningan from Gambir. Overall, I didn’t really have much of a problem since I speak Bahasa Indo 🙂 Once again, thank you Firsta! And for where to stay, I personally think that this place is the best one in Jakarta: Six Degrees Hostel. Jalan Cikini Raya 60 B-C, Cikini, Menteng. Good luck! Terima kasih for the reference to Six Degrees. I have booked into there for my visit in January, and it is VERY reassuring that you recommend this place! Their service on email was professional and VERY helpful, so with that and your recommendation I am confident! My pleasure Brian! Thanks for visiting my blog. Hi,I would like to visit JKT with my mum and daughter in Dec 2013. I checked with Goldenbird taxi service and was told one-way airport pick up to hotel in Jln Sabang costs RP210,000. I paid Rp 150,000 only last year, is there such an increase? Thanks for replying. Just dropping by to enhance people experience. Golden Bird is the most premium version of Blue Bird. That explains the higher price. They come with premium cars as well (normally Benz and high end Toyota). The medium premium is Silver BIrd. Golden Bird is (yes, what you’ve said is partly correct) a premium and car rental. You can also rent like Innova and Avanza with the Golden Bird service. Silver Bird is basically like an executive taxi (the fancy and more comfortable version of the normal Blue Bird taxi). Hi Luke, Good luck on your first attempt to get the Damri bus! 😉 Enjoy and have fun in Jakarta! The Damri bus is simple to take from the airport to Gambir. Just either buy from the counter or on the bus. There will be people shouting out when the buses come in so just listen will do. I do have a question. How to take from Gambir to Airport? When i alighted at Gambir, it was at the entrance of the Gambir train station. Is the bus stop to airport inside the train station or the place i alighted from? The bus stop in Gambir is not far away from where you got dropped off. It is near the mosque in Gambir train station. Noted. I will look for it when i am at Gambir Train station. I assume there will be signboards to show where is it right? My pleasure! Thanks for visiting my blog 🙂 Are you joining the Jakarta Marathon? Hi i am traveling to Jakarta soon and i would like to know how to transfer from Airport to the kemang city. Any reliable transportation? By taxi or by Damri bus until Blok M and continue with taxi. I hope you made it and get to the airport on time. Great post! I’m flying to Jakarta on Wednesday and staying in Pasar Baru. Should I take bus to Gambir? If yes, what do I ride to get from Gambir to Pasar Baru? thanks! Thanks for visiting my blog! Yes bus to Gambir and get a motorbike taxi (ojek) or a taxi afterwards. Probably cost you around Rp. 15,000-20,000 ($2) for the Ojek from Gambir to Pasar Baru. i m comin to jakarta on the 25 of this month like in 4 days i wanna go to pulo gadung in north jakarta coz i have rented an apartment there is there any damri bus which takes me there . Sorry for the late reply. I assume that you are already in Jakarta now. I don’t really know about motorbike rental in Jakarta to be honest (I think you can’t really do it). I hope you are having a great time in Jakarta. The distance between Jakarta’s airport with Central Jakarta probably around 30 km, but the traffic is quite heavy. You can stay around Central Jakarta (around Wahid Hasyim street or Cikini). There are plenty of hotel chains such as Ibis, Fave Hotel, etc. I personally really like Six Degrees Hostel (cheap and great place to stay) in Cikini, you can google and check their website for better view. TMII (Taman Mini Indonesia Indah) is a cool place to go with family. It is like a miniature of Indonesia. My family and I plan to visit Jkt after 20th Dec. We plan to stay at one of the 3-Star hotel, like Ibis Hotel even though I have aunt living in Cibubur. Our agenda is to visit Tanah Abang Textile Market. There will be 5 or 6 of us. Is there a “Maxi Cab” that can accomodate more than 4 adults? How much does it probably cost to Tanah Abang from the airport. By the way, we’ll be arriving using Jetstar. Which terminal will that be? Yes there is a big car that is also used as a taxi. Word of advise: get it from an official counter in the airport, because there are a lot of random people who offer a personal car as a taxi, but it is actually prohibited and normally costs more than a taxi. Regular taxi costs around $10-14 from Airport to Tanah Abang. Do you stay at Ibis in Wahid Hasyim / Cikini? It is pretty close to Tanah Abang. Oh btw, I think Jetstar arrives in Terminal 2. Have a nice time in Jakarta and thanks for visiting my blog. Thankfully the toll road exists to get the Central Jakarta more easily. I arrived at 5pm on a weekday and got into the city in about an hour, and paid 117k plus tolls. I took Damri bus when I visited Jakarta last week, it was a good experience, it took about 40 minutes from Airport to Gambir Station. Thanks for the additional information. I assume that is the one in Terminal 2 isn’t it? So sorry for the late reply 🙁 I just read this. Should be easy with Damri bus to Gambir as well. I’m flying into CGK late night almost close to midnight so does that mean the Damri service is not available then? I will be staying in the Kuningan area. What options do I have to travel from the airport? Officially, the Damri service is available until 11.30 pm. You can try to go to the Damri’s counter to ask if they are still available when you arrive or get a taxi. Approximately will cost you around $10-14 for the taxi to Kuningan. Hope it helps. That would be fantastic! No more traffic. Hehe. We’re travelling to indonesia with 5 people this summer, i lived there when i was a child and am now going to be showing my children around :). For the five of us, what would be a good way to get downtown, we’ll problably stay near monas. Any ideas on that? Thank you! With Damri it will cost you Rp. 30,000 x 5 = Rp. 150,000 (if you are going to stay around Monas then take Damri to Gambir, Monas is walking distance from Gambir). With cab, you are going to need 2 cabs and it will cost around Rp. 130,000 x 2 = Rp. 260,000. There are maxi Taxi thingy, but I am not really sure about their cost. So I guess Damri is the best option. 🙂 Have fun later on in Jakarta! What is the cheapest way to get to Plaza Indonesia from the airport and how much longer does it take than a taxi? It is so difficult to predict about travel time in Jakarta since we can’t predict the traffic. The cheapest way would be get a Damri bus to Gambir. From the station you can get a Taxi/motorbike taxi/Trans Jakarta bus (need to make sure about the route, I think you probably need to change bus 1 time) to Plaza Indonesia. Approximately the cost is between: Rp. 33,500 – Rp. 65,000 to get from the airport to Plaza Indonesia. we will visit Jakarta in March and arrive around 10pm at the airport. We would prefer to go by Damri-Bus as it is much cheaper. As you said the buses run to gambir till 11.30pm that would be perfect. In my travelguide I read that the bus runs only till 7pm…but maybe that is a mistake. Can you tell me if there is usually a bus after 10pm? Thx. I think it wouldn’t be a problem, I still able to find the bus around 10.30 pm last time. My advice, straight away after landing go to the DAMRI ticket sales counter and ask if the bus is still available / not. I hope it helps! ok, this my first time i want to going jakarta. the transport of which is cheap and safe if I want going to bekasi timur. Omg Ariff, sorry for being super late to reply this one. Damri bus serve CGK (Soekarno Hatta Aiport) to Bekasi. Just make sure for Bekasi Timur / Bekasi Barat. Have a great journey! Thanks for helping but i will arrive Jakarta after two days and i need to go from the airport Soekarno Hatta to this address Jl. Baung Kebagusan, Jakarta Selatan, Pasar Minggu. What is the best transportation and how about the time between the Airport and this area. In the 11th of May (Sunday) I will arrive at the airport around 11pm with a group of 22 people! We are staying at the Six Degrees hostel. What is the best transportation for us to go there? Thanks a lot!! 11pm is a bit too late for Damri bus and 22 people is not easy to manage, isn’t it? :p Damri bus ticket is Rp. 30,000 / person now (From Gambir, you still need to get a taxi from Gambir to Six Degrees hostel). I personally think that taxi is the best option. You can fit in 3-4 people in one taxi. Get Blue bird, Express or Gamya. Thanks for this very informative blog. I will arrive in Jakarta by the 2nd week of May. Hopefully, all works. Thanks for coming to my blog 🙂 Have a great time later on in Indonesia. Hi Firsta…where can I find the cheapest car accrs in Jakarta..I’m flying with my family in early mei..tq. I don’t know anything about car accessories to be honest. But try Kemayoran. I think a 24 hour taxi services would be available. Blue bird & Express use taxi meter so they won’t have any extra charge (but they have some kind of airport charge for -/+ $1). Tq..it ok…we stay at Favehotel Glodok…so why do u think about that..thnx for ur comment.. Thanks for all your info, where can I exchange money at Jakarta airport? Coming to Jakarta central on this Wed, looking for a worth going factory outlet. Any recommendation. The DSE in Mangga Dua Square is decent enough if you’re in that part of town – http://www.fo-community.com/our.php?id3=21 – it’s affiliated with some of the factory outlets in Bandung and carries similar stock. Thanks for the Damri bus info. Do you happen to know at what time the first bus leaves in the morning from the airport to Gambir ? According to the timetable, the earliest bus from Gambir to the airport is at 3.30 am. So I guess the Damri bus from the airport back to Gambir starts afterwards, which is probably around 4.30 am (Btw, I remember I took a Damri bus from the airport at 6.30 am). Hope it helps. So yes there must a bus at least 4.40. But maybe the bus starts at airport. Is that possible ? I’ve been trying to get a timetable from the Airport side. Is that not avalaible anywhere. I had a look at the Damri website but it is indonesian only. I may have missed something. What do you think ? I’ll try again when I get a chance and update it here. Just wondering, what time you’ll be arriving in Jakarta? Well the result? I have booked a flight ticket to fly over to Jakarta this weekend. =) Firsta, could you please advice me on where can I get best desserts other than Magnum Cafe in Jakarta? I will be staying at Pullman Thamrin, preferably restaurants nearby there. THANKS A LOT!!! Thank you for spending almost 2 hours here! 🙂 I hope the time was well spent. Some of my favourite: Red velvet cake at Union, Plaza Senayan; Honey bread at En Dining, Plaza Indonesia (cross road from Pullman Thamrin); Chocolate brownies (I am not sure about the name though, but it is something like that) at Komala Restaurant , Sarinah building.. Omg I am feeling guilty for not recommending any Indonesian dessert :/ (btw, are you Indonesian??) I personally really like Pisang Ijo Pemuda (it is located in Kelapa Gading, Kemang and Tanjung Duren so unfortunately quite far from Pullman Thamrin) or you can have try Kafe Betawi at Plaza Indonesia mall; they have various Indonesian food with all the dessert as well. Their es campur, kue rangi are worth trying. I hope you have a good time in Jakarta! No doubt that my time was well spent reading (stalking) your blog. MANY THANKS for the reply too. I will for sure check on all the restaurants (foods) you suggested to me. Oh btw nope, I am not an Indonesian. Yes the CFD is still happening, I guess the schedule is 6am – 12. Don’t have any clue about bicycle renting there though. You can get a taxi from the hotel and get the back road (Agus Salim street). Hope it helps. Thanks a lot for all the tips. My trip was no doubt a successful & enjoyable one with your help. I will for sure fly back again to Jakarta soon. Keep posting & i will for sure keep stalking on your blog. My pleasure! So glad that you enjoyed the trip! Thank you for sharing useful information with us. I’m planning a 4D/3Ns trip from Jakarta to Ujung Kulon National Park. To save more money, we decide to approach there by bus. 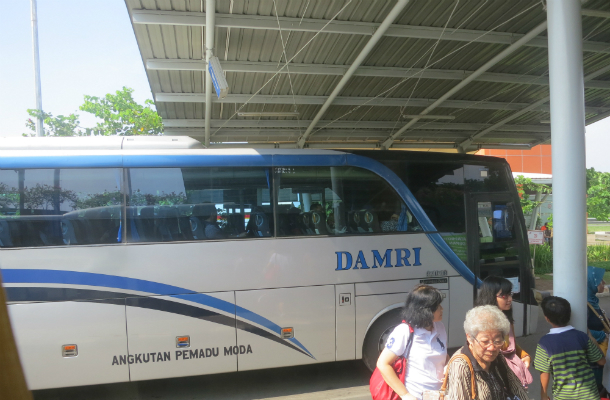 i noticed that there is a Damir Airport bus to Serang, Do you know how often they starts at the airport? Is it easy to get to the Park from Serang? Hi Ian, yes I think there is a Damri bus that goes directly to Serang. You should check at the Damri counter once you arrive at the airport to make sure. I never been to Ujung Kulon National Park, so I don’t have any idea about it. 🙁 Sorry can’t help. I am travelling to Jakarta for the first time on 11th of July. I need to go to Hotel Santika Premiere Bintaro (Kota Tangerang Selatan). Any suggestions from you to reach the place safely would be appreciated. Take a taxi (Blue Bird taxi is the best one) should be quite a safe option, though looking at the distance it is quite far. It will cost you around Rp. 200,000-ish. Hi there! Anyone who knows what time the last bus is going to the airport? I went today to ask, but I am not sure if they understood me completely, since they told me that the last bus is going at 3 o’clock? From Gambir station, on schedule the latest one at 8 pm. Can you please help us out? Next Thursday we,a group of 5 persons, will arrive in Jakarta flying from Amsterdam on Thursday next week. 5 persons and 5 big suitcases. We stay over for two nights and sleep in the Novotel Jakarta Gajah Mada. A normal taxi is too small. What could you recommend us? Is there a taxi Van and which taxi company should we choose (cheapest and safiest)? Thanks already for your effort and answer. There is a maxi taxi counter at the airport. It looks something like this: https://discoveryourindonesia.com/wp-content/uploads/2013/12/taxi-counter-airport.jpg. As for the taxi company, I recommend Blue Bird or Express (the one on the picture is Tiara by Express taxi). I don’t have any idea about the price, but I would suggest taking the maxi taxi. Have a great time in Jakarta! I am travelling to Jakarta for the first time on 26th of July. I need to go to Fave Hotel LTC Glodok. Any suggestions from you to reach the place from airport safely would be appreciated. Hi Adilla, you can take the Damri bus from the airport to Gambir station and then continue with taxi (pick Blue Bird taxi) to Fave Hotel Glodok. If there is no traffic, from Gambir to Glodok should take around 15-20 mins. Total cost should be around Rp. 65,000. If you take taxi straight from the airport, total cost would be around Rp. 140,000. We’ll be travelling this Thursday to Jakarta and will be staying for a few days in the Artotel overthere. Best way tot get there is take a bus to Gambir and than get a taxi (Blue Bird ?) to the hotel ? Any idea about taxi prices ? Yes. You can take Blue Bird / Express / Taxiku, there are all ok. The taxi should cost less than Rp. 50,000 (usd 5) from Gambir to Artotel. It is not that far, please see this picture. https://discoveryourindonesia.com/wp-content/uploads/2014/07/Map1.jpg. Oh btw, people usually walk from Gambir to Jalan Jaksa (you can find Jalan Jaksa in the picture as well). We´ll do and after we´ll be flying to North Malukku. Hi. From Gambir Station alighting a Damri bus, is Jalan Cikini Raya within walking distance? If I am to ride a bajaj to Jalan Cikini, how much would the trip cost me? I am ding extensive research up to the last IDR that I will spend before I head to Jakarta since I’ll be coming in as a student and I don’t want to be tricked by drivers. Thank you so much, your blog has been very informative and helpful thus far. Hi Mariel, I. Approximately around 4 km. It costs below IDR 50,000 by taxi, and bajaj (or a motorbike taxi perhaps if you don’t bring a lot of stuff) should be around IDR 20,000. Hope it helps! You said the last DAMRI bus leaves around 11 pm? Is that still the case today? I will arrive around 11:30 pm in Jakarta, so the only option to go to Jaksa is taxi, right? Is the cost for a taxi higher at night? Yeah I think 11 pm is the last one. You can check to the Damri counter as soon as you arrive. Taxi charge should be same 24 hours. Hi Firsta, if I stay at Harris Suites (fx mall) in Senayan, is this walking distance to lapangan d senayan stadium? And what would be the best option for transportation to and from the airport? Will be watching a concert this September and I’m afraid we’ll have trouble with transportation going back to the hotel if we stayed in Kemang, Cikini, or Jaksa area. Thanks in advance! Hi Chey, Yes it is within walking distance from FX mall to Gelora Bung Karno Senayan stadium. 🙂 The easiest way to travel to and from the airport is by taxi or if you are looking for a cheaper option (from the airport) get a Damri bus to either Gambir or Blok M and continue with Trans Jakarta bus. A taxi will cost you around IDR 150,000 (can fit it 3 people) and the bus should cost you below Rp. 40,000 per person. Hope it helps! I’m going to Jakarta on September 5, 2014. Could you show me the cheapest way from Soekarno-Hatta Airport to Bung Karno, Lapangan D Senayan stadium. And can you show me how much is it? The cheapest way is get a Damri bus to Blok M (probably IDR 30,000 or IDR 35,000) and get a Trans Jakarta bus from Blok M terminal to Gelora Bung Karno shelter (IDR 3,500). Hope it helps and I hope you enjoy your time in Jakarta. When i arrive Blok M, do I have to across the opposite site to catch a trans bus to bung karno stadium, does it has number on bus? After watching concert, i will back to Neo hotel tanah abang-cideng, I’m afraid that trafic jam will happen at that time (too many people- around 11pm)and difficult to catch a taxi back to hotel. And around 11pm,still have bus or not ???? If I catch a taxi, how much does it costs?? The TransJakarta bus from Blok M only serves Blok M – Kota route so you won’t get the wrong bus. From the Damri bus stop in Blok M, which usually stops near a mall (outside the terminal), you should cross the road to the Blok M Terminal or just ask people where you can find the Trans Jakarta ticket counter (it is underground, below the terminal). I am not sure where the Neo hotel is, but you can get the TransJakarta bus again from Gelora Bung Karno shelter to Sarinah shelter and from there you can either walk or get a motorbike taxi. The TransJakarta bus is 24 hours on that route (Blok M – Kota). Hope it helps. Iya Kak Cumi, ini artikelnya udah rada lama 🙂 Masih 25rb waktu itu. Heheh.. revisi deh artikelnya biar ga salah. Oh wow! That is impressive (and amazingly cheap)! Airport to this hotel by taxi ? It costs around 120,000 – 175,000 IDR. Have a great time in Jakarta. I don’t know where Fave Hotel Gatot Subroto is exactly. You can save money by taking the DAMRI bus from the airport to GAMBIR (30,000 IDR) and get a taxi from there to the hotel (around 40,000 IDR; depends on the traffic). Meanwhile, a taxi from the airport straight to the hotel should be around 125,000 – 170,000 IDR (again it depends on the traffic). Hard to tell how much rupiah (IDR) that you need in one day for transportation and food in Jakarta. It all depends on where you want to go / explore, what transportation that you are going to use and where or what you want to eat. At a guess, roughly 250,000 IDR should be ok.
That’s so much for your valuable details . It’s better I go via a lawyer here ? Hi Firsta, I am so glad that I checked your website. Thanks for all the help you are providing. Next week I am coming to Jakarta. Please tell me what’s the best way to go to central Jakarta from CGK . I will be staying at Holiday inn express or Amaris Hotel. How far is central Jakarta from CGK. How much it will cost by Taxi. Thanks in advance for your help. Not sure which Holiday Inn Express or Amaris Hotel that you’ll stay in. To go to the Central Jakarta, you can get the Damri bus to Gambir station or get a taxi with cost around $12-$15. Have a great time in Jakarta. Dear Firsta, I am glad that I found your blog and you are doing a wonderful job in helping both national and international individuals. May God bless you. I have a plan to visit Indonesia to visit the PT Jakarta International Expo in the month of October. Appreciate if you can advice the location to stay so that I am close to the exhibition center and don’t spend much time in travelling also, not to stay away from the city centre. Thanking you in advance. Kemayoran area isn’t it? There are several chain hotels like Ibis Kemayoran Jakarta. Kemayoran area can be really trafficky. Sometimes people choose to stay around Mangga Dua, but if you are planning to spend time mostly at the Expo then staying in Kemayoran is better. mau tanya tentang damri bus. apakah semua damri bus dari airport pasti tujuan ke gambir. apakah ada tujuan ke tempat lain seperti sunter. saya tinggal di sunter. lebih baik naik bus atau naik taksi. kira kira harga berapa yah. Bis damri banyak jurusannya kok dari CGK. Kalau mau ke Sunter, bisa naik yang jurusan ke RAWAMANGUN dan turun di Rawasari. Rawasari cukup dekat dengan Sunter, dari situ bisa naik Taksi atau Ojek. Damri nya 30rb dan Taksi dari Sunternya mungkin sekitar 25-30rb. Hey Firsta. Great Blog. Im flying from Australia into Jakarta on my way to Sumatara. Can I get some rupiah in transit in Jakarta ?? Yes. You can find money changer at the Airport or you can take money out from the ATM machines. Is ATM machine in transit area? Not after immigration. Can you get money without formally entering Indonesia at the airport (not pay for visa). Yeah, I don’t think there is any ATM machines before the immigration. Not sure about the money changer thou. They now have ATM’s available before immigration – I guess too many people were turning up for a Visa on Arrival without any way to pay for it. I do recommend bringing US$ to pay for a VoA though as the exchange rate they give if you pay in Rupiah is terrible. I have not been able to find a map of the tourist city tour bus (double decker) route. Can you supply a link to a route map? Hi, This is the route: Museum Nasional-Pecenongan-Halte Juanda-Halte Istiqlal-Monas 1 (Jl. Medan Merdeka Utara)-Monas 2 (Jl. Medan Merdeka Barat)-Balai Kota-Sarinah-Hotel Indonesia Kempinski. Can’t find the map. is the gambir bus station the same with the train station in jakarta kota? coz im checking google map right now. Gambir is a train station, but not the one in Jakarta Kota. It is different train station. hi firsta! im going to jakarta this november and stay there for 3 days. if my hotel is in mangga dua in tamansari, which bus do i take, and where do i get off from the bus? thanks! You can take the DAMRI bus to Gambir and get off at the last stop, which is Gambir train station. You can continue with taxi from there. Hope it helps and enjoy Jakarta! I’m travelling from Kota Kinabalu to Jakarta by Air Asia end of this October. ETA at Jakarta airport around 8.30 pm. will be staying at Holiday Inn Express Thamrin @ Jl Tanjung Karang No 1 Jakarta. Please advice me the cheapest way from hotel to hotel. thank you in advance. The cheapest way is taking the Damri bus to Gambir or Blok M station (it should be 35,000 IDR for the ticket) and continue with Trans Jakarta busway from Blok M or Gambir to Tosari shelter. From Tosari shelter you can walk to the Holiday Inn Express. The Trans Jakarta busway ticket is 3,500 IDR, but you should use the Trans Jakarta card (can’t use cash). I think the card costs 20,000 or 40,000 IDR (the amount will be your balance and you can use it again later). Can try to find a helpful local who is willing to cover you with his / her card and hand the 3,500 IDR cash to her/him. Or, just take a motorbike taxi (Ojek) or taxi from Gambir station or Blok M terminal. Hope it helps. Ah, since I will be arriving in Jakarta past 11PM, my only option now is to take a taxi. I hope the immigration check will be smooth for me to immediately leave the airport. Thanks! I’ll be travelling next month to Jakarta (Grand Indonesia Mall) to collect my racepack. Can you help me what bus to take to reach there from Soekarno airport? And best way/transport to retun from Grand Indonesia to airport? Hope u can help me. Thanks in advance. The cheapest way would be by DAMRI bus from the airport to city center (either GAMBIR or BLOK M) and continue with TransJakarta bus (stop at Tosari or Hotel Indonesia shelter) or you can continue with a taxi from Gambir / Blok M. Hope it helps. Yeah I’ve heard about it. It is like a minibus and not a Damri bus I think. Never used it so I don’t really know. Thank you. Is the minibus safe to travel? How much will taxi cost from Gambir to Grand Indonesia Mall? And taxi from Grand Indonesia to Airport? Thanks again for the help. I will be travelling next weekend. I never try the minibus, but I think it should be ok. Taxi from Gambir to Grand Indonesia is around 40,000 IDR. From Grand Indonesia to the Airport, perhaps around 150,00 IDR. Yey! Success! I am now in Jakarta. I followed your advise and took Damri bus to Gambir station. I cannot find the minibus to Thamrin City mall. From Gambir station, i took a Bluebird taxi to Grand Indonesia and the cost is only 25000 IDR and vice versa. However, i received a bad news from the Nike organizer. All along i thought everything is ok because my transportation is very easy. Thanks to your advise. Anyways, maybe you can help me. Can i send you a personal email? Yeah sure just shoot me an email. Hehe. Where do i send my email? Not sure where to reply. Hehe. Can i send you a private message in fb instead? Hi Yvette, if you go by Damri (to Gambir station) bus and continue with taxi; it might costs you around Rp. 80,000 IDR. If you go by Taxi directly from Airport to the hotel, it might costs you around Rp. 135,000 IDR. As New Mirah hotel is located in Gunung Sahari, you can try to check out Monas, National Museum and Old town. Have a great time in Jakarta. Hi. Your blog is really helpful. I’m going yo Jakarta on Monday, November 10th. I’ll arrive around midnight. Can you please tell me some tips and advices about taking a taxi? I’ll be staying at the Amaris Hotel Tendean. I am glad to hear that you found this blog helpful. About taxi, I personally recommended Blue Bird, Express Taxi or Taxiku. There are taxi counters at the airport and it is quite easy to find. Btw, it might cost around 150,000 IDR from Airport to Tendean. Good luck! Thank you for your detailed information, which is useful for a first time traveller to Jakarta. I am staying at HARRIS Hotel and Conventions Kelapa Gading… Is there a minibus going from Airport to there? How much will taxi cost from Airport to there? Thanks in advance. I will be travelling next weekend. I don’t know about the availability of minibus from the Airport to Kelapa Gading.. You can go there by taking taxi from Airport directly to Kelapa Gading or get a damri bus to Rawamangun and continue with taxi from Rawamangun terminal to Harris hotel. Currently I am busy packing and preparing work stuff before the trip. Do you know if I flying out of Jakarta do I need to pay something like a departure tax? How much is it? I will be going to Jakarta on Dec 9 with my family. We are a group of 4 adults and 2 children. The hotel that we are staying at is Holiday Inn Kemayoran, Jalan Griya Utama. What would be the best option for us for an airport transfer? Also, what transports would be preferable to shuttle us around Jakarta? Last but not least, is there anyway for us to go to Bandung for a day trip? Thank you and sorry for so many questions. I will arrive around 11:30 pm in Jakarta, so the only option to go to Pasar Baru is taxi, right? I know the cost for a taxi from the airport to the hotel in Pasar Baru is around 125,000 – 175,000 IDR. Do you know how much it would cost for the tolls? The taxi drivers always want a ridiculous amount for the tolls. Thanks. hope you doing well. Me n my mom will be arriving CGK 27th dec 14 early morning. We’re wanted to get to Yogyakarta. From CGK how do we get to any train station and directly to Yogyakarta? Hi Esther, You can get the Damri bus to GAMBIR. An executive train is available from Gambir station, Jakarta to Tugu station in Yogyakarta. You should book the ticket online before the departure date. What you’re doing here is absoulutely fantastic. I thought maybe I’ll ask you for some help as well since you are sorting out lives of so many travelers. I’ll be heading to Jakarta for the first time and would be staying at NEO Hotel Mangga Dua since it’s close to PRJ Kemayoran. I’m a little tight on budget as I’ll be on a month long SEAsia trip….so could you please suggest the cheapest and of course safe way to reach NEO Hotel Mangga Dua from the Jakarta International Airport. And how much should it cost me roughly? Also, I would like to spend my last 2 days at Six Degrees hostel so what would be the cheapest and safest way to reach there from NEO Hotel Mangga Dua? Or let’s say how much would a blue bird taxi cost me for this distance? Your info and suggestions will be much appreciated. Thanks very much! Btw, I’m beginning to be a fan of your blog. You can take a DAMRI bus from the airport to KEMAYORAN or MANGGA DUA, you should find out first which one is closer to your hotel. It costs Rp. 40,000. You can take the Trans Jakarta busway from Mangga Dua (Neo hotel) to Gambir station and from there you can take a motorbike taxi to Cikini area (Six Degrees). That is probably the cheapest way. Cost of blue bird taxi from Mangga Dua to Cikini area is a bit tricky though. Perhaps around Rp. 55,000.. not too sure. It also depends on the traffic. Thanks so much for the valuable information. This will surely help me plan better. Hi Gigi, take the one to GAMBIR and off at the last stop, which is the Gambir train station. From there you can take the motorbike taxi or taxi to Tanah Abang. Good luck! I am traveling with my boyfriend from Spain to Soekarno Hatta Airport. Our flight arrives at 22.30 pm, and I have read that at this time of the night there are no reputable taxis at night, is this true? Should we take a hotel close to the airport or what? Taxi should be ok as long you pick the reliable one; like: Blue Bird. Never get train from Jakarta to Purwokerto, is that from Gambir train station? If yes, you can get a hotel near Gambir train station to make it easy. Not sure about your question. Where do you want to go to? I am arriving at the Jakarta Soekarno Hatta International Airport but should take an internal flight from Jakarta Halim Perdanakusuma Airport to Yogyakarta. As I will visit Indonesia with my wife and kids, could you advise me on the easiest way for the transfer of airport please ? What would be the cost and the transfer time to go from one airport to the other ? Many thanks in advance for your help ! There is a DAMRI bus from CGK (Soekarno Hatta) to Halim, but I don’t have any idea about how much does it cost now (it was Rp30,000 per person early 2014) and the timetable + transfer time. Other option, can get a taxi.. the cost maybe around Rp200,000, really depends on the traffic. The traffic can be really heavy on CGK – Halim route. Hi. I will be flying to Jakarta in August for 2 nights; arriving Saturday 7 pm and leaving Monday 7 pm. I would like to have a quick flight to Bali for one night and stay at Jakarta for another night. what would you recommend? I am thinking: Fly to Bali and stay Kota for Saturday night, come back Sunday night and stay in the city center in Jakarta, check out the night life and check out places to see Monday morning, then head back to airport. For a 7 pm international flight Monday, when should I leave the city? Thanks! If you want to have a quick visit to Bali, it is better to fly to Bali and stay there for two nights. Fly back to Jakarta on Monday (perhaps flight at 1 pm?). Naik taksi? Umm.. harusnya ada Damri ya, tapi aku belum pernah juga ke Halim, jadi kurang tau. Thank you, it’s very usefull! Im coming to Jakarta soon but only for three daus.I have found lots of helfull information on Your blog.Thanks for that.Im wondering about cheap City Tour, can i buy some one day city tour in Jalan Jaksa and what is the price? I found some offer online but it is bit expensive 50 USD per person. I would like to go from the CGK airport to the Artotel hotel in Thamrin. Do you know which DAMRI bus I should take? To go to Artotel Hotel, you can get the Damri bus to Gambir, afterwards you can get TransJakarta bus and get off at Sarinah shelter or take a taxi / motorbike taxi. Great blog! I will be visiting Indonesia for the first time during second week of April, and your blog, with its attention to detail, has really helped me get my bearings already. 1. After landing at Jakarta airport, I plan to visit Bandung first. My hotel is Bandung is near the train station (Mutiara Hotel). Do you recommend that I take the Damri bus from Jakarta airport to Gambir and take the train to Bandung, or I take the bus directly from the airport to Bandung?. My flight from KL would be landing at 14:15. 2. Do tickets get sold out on the train to Bandung? Would I need an advance booking. I land on a weekday. Halo, kak. Kalau kebalikannya, dari Jakarta ke Bandara, aku bisa naik Damri dari mana aja ya? Hi firsta! thats a great article! would you know how to get from pasat senen train station to the airoort? this would be the ekonomy class train station. also, i am arriving at 2:45am, would you know if the shuttle bus run at thet time of the day? i read somewhere that it runs 24hs. I don’t know if there is any Damri bus from Senen to the airport. You can either get a taxi from Senen to the airport or go to Gambir train station, can go by Trans Jakarta bus or an ojek. From Gambir train station, you can get a Damri to the airport. As I know, nope! The last Damri bus from the airport is 11.00 – 11.30 pm. Hope it helps. I am going Jakarta on July’15. I do not book any hotel but I collect some hotels address at Block-M and Mangga dua area. So, can i book hotel after reach Jakarta? Thanks for your reply. If I want to take a private car rent with driver in Jakarta for full-day (10-12 hours) basis then how much need to pay and how i can contact with them. Pls help. Try to contact Blue Bird. I think they have private car rental service. Probably Rp 750,000 per day (for 12 hours max usage). many thanks for all the useful information. Actually I’m looking for a fastest way to get to Gambir from the airport. I land at 6 p.m. and the train is leaving from Gambir at 8:45 p.m. Do you think it is possible to be at Gambir on time? Honestly, that is pretty tight timing. The fastest way is either by taxi (but you can’t do anything if there is traffic jam) or motorbike taxi/ojek (?) – I never experience it though. 🙁 Good luck! As a rule of thumb I usually end up leaving the airport about an hour after my flight lands, that takes into account buying a visa on arrival, being processed by immigration, waiting for luggage and passing through customs (generally I’m on a flight arriving 6pm’ish). So with an hour and 45 minutes left as Firsta has said it’s likely to be tight. If you’re arriving on a Saturday evening you may have better luck as traffic is generally lighter, but with Jakarta you can never know for sure. I wish you luck if you do go for it though (and on the plus side for you I’ve found trains often depart late from Gambir – certainly no guarantee, but it might give you a bit of extra time). thank you for your valuable insights. I’m arriving on Thursday 2nd July and since I have already booked the train, I will go for it and share the experience afterwards. If you had any more hints how to speed up the transfer, I would be grateful. I’ve got a few tips to speed things up. Be as quick as possible to get off the plane so that you can beat the queue for buying a Visa on Arrival (especially if there’s lots of non-Indonesians on your flight). Having US$35 in cash handy will help speed things up too. If you don’t have any Rupiah before you arrive there’s plenty of ATM’s in the arrival hall near the baggage carousels. Getting money out there is recommended over waiting until you’re through customs, as stepping out into the public area of the arrivals area can be overwhelming on a first visit and you probably want to minimise your distractions. Finally, ignore all touts trying to offer you a ride on your way to the taxi ranks. Head straight outside and look for Blue Bird taxis – at times there can be a queue, but generally things move pretty quickly. Then just be sure to have cash ready to pay tolls along the way and it’s all down to the traffic gods! Thanks a ton for the advice! I will follow the tips to the letter. I just wonder if you have made it to get on time for your train? Please help choose the best place where I can stay for one night. 21:40 am flying on to Jakarta Soekarno Hatta airport. The next day at 20:35 from the same airport to fly home. I have one day to Jakarta. I plan to visit Ragunan Zoo and Taman Mini Indonesia Indah. That’s why I care to find a hotel where the morning is easy to get local means of transport. Please help where it is best to stop. Hi Magda, I wouldn’t advise visiting Taman Mini Indonesia Indah and Ragunan Zoo in one day. So sorry can’t help, I don’t have knowledge about hotel nearby Taman Mini Indonesia Indah or Ragunan. The best placed hotel for a visit to Taman Mini is the Hotel Santika which is at the entrance to the park – http://www.santika.com/santika-tmii . I haven’t stayed at this particular hotel, but others in the Santika chain that I’ve visited have been decent mid-range places. I’d echo Firsta’s comments about being wary about going to both Taman Mini and Ragunan Zoo on the same day, there’s certainly a risk of losing a decent portion of your day just being stuck in traffic. Keep in mind that your journey time to the airport is also likely to coincide with the evening peak as well, so expect it to be a slow trip. However, perhaps badly I expressed. I want to sleep at a hotel in the center. Not near the Taman Mini Indonesia Indah or Ragunan Zoo. Only in such a place downtown that I had a good mix of urban transport to these places. In a place where the center easily got the night from the airport. However, I want to get up in the morning, come through the center of 1-2 hours and go to one of these attractions which I wrote. Just to clarify, were you wanting to get a hotel in the city centre of Jakarta so that in the morning you could look around the sights in the city for a couple of hours, then go to Taman Mini or Ragunan Zoo and from there head off to the airport as well? It seems a relatively optimistic plan if so, except perhaps on the weekend. You make reference to a place downtown with a good mix of urban transport. Whilst there is the busway in Jakarta it’s fair to say its maintenance has been underwhelming in general on both the buses and bus stops, but it’s somewhat functional. That being said, there is a direct route from Monas to Rangunan Zoo (Line 6) so it’s feasible if you want to avoid taxis. The Monas area is also right next to Gambir station, one of the Damri bus stops, so it’s cheaper than a taxi for getting to and from the airport. There’s a wide range of accommodation available in that general area as well, it basically comes down to your budget as to what your best pick would be. Finally, did you have a plan in relation to luggage? If you need to return to your hotel after sightseeing to pick up your bags that’s more time lost. I’m not sure of any left luggage options at CGK, but that might be another option to save on some hassles if you’ve got a bit of luggage to worry about. You are wonderful. Very thank you all for response. Well, I think in this case I will go by bus to Gambir station from the airport and in the morning take a taxi to one of these attractions. I decide on the spot which one. As for the big luggage I wanted to leave it at the airport in the vault. In order not to waste time returning to the hotel or do not ride with him all day. I hope, however, there is a luggage storage. I never met at the airport so this was not. Once again, many thanks for your answers, it really helped me. I’m going to Jakarta on July 2015. I will land in Soekarno Airport at 2 a.m. and then I’d like to go directly to Halim Perdana Kusuma Airport and get a plane to Yogyakarta. Do you already know what is the best way to get from one airport to another, how much it costs (2 adults with a child) and maybe how long does it take? If you’ve never been to Soekarno Hatta airport before just be sure to keep your wits about you at that time of night. It’s not an especially dangerous airport in general, but it’s certainly a time that the dodgier taxi operators are likely to be lurking around – Blue Bird is your best bet (or even better, Silver Bird if you want comfort, though that comes at an increased price). On the plus side, at least at that time of night you don’t have to worry about traffic! Thanks Firsta and N8 for your advice! could you please guide how to use damri to reach grand sahid jaya hotel from airport? Thank you for all your valuable tips! I have a question for you. How to get from Soekarno Hatta airport to Jakarta Kota Railway Station? Can I take a Damri bus? I think you can get a Damri bus to Gambir and from Gambir, take a train to Jakarta Kota station. Hope it helps. I wanted to ask you if you would recommend travelling by train (jakarta to yogjakarta) ? is it a nice view? is the time worth it? We didnt want to take the plane cause we want to enjoy the landscape, but we dont even know how it is. Maybe we stay in Cibodas for a night or two. have you been there? I’ve been to Cibodas ages ago, probably when I was 12-15 years old. 😀 It was a great area to explore. Hi Firsta and all ! Does anyone knows how to read Dambir’s timetable ? Me and my wife are going to land in Soekarno Hatta airport at 11 p.m. and we were wondering about their last trip to Gambir..
Hi Ulderico, I think you should get a taxi. If you are going to land at 11 pm, most likely you’ll be out from the airport (and able to reach the Damri bus counter) around 11.30 – 11.45 pm and that is too late – I think the last bus is at 11 pm. It takes a while at the immigration gate and collecting your luggage. Hope it helps! Hi Firsta, can you advise me how can i take a bus from Soekarno Hatta Airport to Grogol area (Jakarta)? I am currently enjoying my holiday in Indonesia. While planning this trip I came across your very helpful blog. Due to it I knew what to expect from the taxi drivers at Jakarta airport. As my flight was delayed to arrive at 01.30 I could only take a taxi to my airport hotel. Inside the airport they asked 200.000! As I was staying at airport and not in Jakarta I turned away and went outside. Overthere they thought it would be around 80.000. In the end with meter on in Bluebird it was 40.000 only. 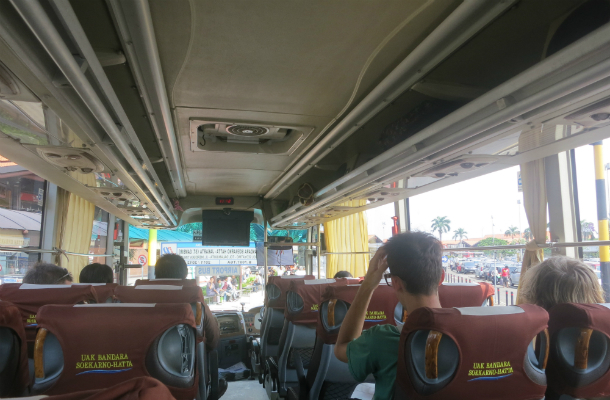 The next day we found Damri bus to Bogor easily with help of your blog. In center city now you can use GO-Jek to go everywhere, just download application in your android or IOS. and you can book Ojek transportation. True, but not from the airport. Dear Frista, it is a great service you are rendering to the people who are visiting jakarta. I am a solo traveller visiting jakarta 4th november and will be there upto 7th february. have booked the hotel amaris at mangga dua square. i am going to attend the expo during these days happening at Ji International Expo. Please suggest how can i go from the hotel to the expo ground, how far is it ? or can you suggest any other hotel near to the expo. There is Damri bus from the Airport to Mangga Dua (I don’t know exactly where is in Mangga Dua, but you can ask to the lady / guy on Damri counter). So sorry, I don’t really know how far it is from Amaris Mangga Dua Square to Jakarta International Expo (from Google maps it is 7-8 km distance, probably take a taxi should be ok or Trans Jakarta bus combined with motorbike taxi). Hope it helps and have a great time in Jakarta. sorry, i am going to stay only upto 7th november, 4 nights, by mistake i typed upto 7th february. My question is this, from CGK to Jakarta City Proper, how long does the DAMRI bus take considering traffic and all? Is there schedule of trips like every 30 minutes? Is taxi a faster option? Also we can take same route of DAMRI bus from city back to airport? We have very limited time to spend in JKT when we land there then go to Jogjakarta so I want to know. Thank you very much for any insights you can share to me on this. Yes, usually you can take the same route from the city to the airport with the Damri bus. I meant city proper like Central Jakarta I think 😛 where Monas tower, museums and jalan jaksa is. If we are after speed of getting to city, taxi is better than Bus? Me and My Friend are planned to travel jakarta on 16 Feb 2016. My Flight reach Jakarta By 8 AM Morning. Can We Catch the train to Bandung (Argo Parahyangan 24) By 10.15 am. Is Train route From Jakarta to Bandung is Scenic or By Taxi Route. The bus and taxi ride usually takes around 1-1,5 hours. Taxi is obviously faster than the bus. Me and my parents would be going to Jakarta in november.. may i ask is it convenient to take the damri bus with big luggages? As my hotel is near gambir railway station.. so is it more convenient to take the taxi or bus with luggages? Have a great time in Jakarta. I never spend the night at the airport or the train station so I don’t really know how it is going to be. 🙁 My suggestion would be heading to the train station and wait there.. It should be better than waiting at the airport, I guess. You can find plenty of places to eat and see a bit of Jakarta by heading to the town. Gambir is super close to some Jakarta’s landmark such as Monas. Hope it helps. So I guess train station is open for 24hours right? i will visit jakarta on 31st october and stay in senen indah hotel and what will be the best way to get there from airport. I will travel with my wife who has in indonesia in 19981 to 1982. hope she can manage little bit of bahasa indonesia. from jakarta will go to yogja by train. I want go by 6.15am train from senen and how could i book tickets? If you would like to book a train ticket, just go to their official website: www. tiket.kereta-api . co . id. or you can use online booking agent like tiket . com. I think it is better to go by taxi to Mulia Hotel. Or you can take Damri bus to Gambir or Blok M, and continue with taxi. All the best for the journey. Kak Rista, aku dr Soetta perlu langsung ke plasa senayan. Aku baca di rute damri yg jurusan Blok M lewat Senayan. Nah itu aku turunnya di mana ya? Jauh ngga dr Plasa Senayan? Trus di bus damri ada pengumumannya ngga berikutnya halte apa kyk busway gt? Kamu bisa naik Damri ke Blok M, turun di Blok M. Dari situ, kamu harus jalan kurang lebih 200-300 meter untuk ke terminal dan loket untuk membeli tiket busway. Nanti turun di Bunderan Senayan / Ratu Plaza (bisa disampaikan ke mas/mbak yang berjaga di dalam bus). Hrs ke Blok M dulu kah? Ngga bisa damrinya lsg berhenti di Ratu Plasa? Moon maaf ya, saya tidak hafal persis rute setiap bus Damri. 🙂 Setahu saya, bus Damri tidak bisa menurunkan penumpang di sembarang tempat (tetapi memang ada 1-2 lokasi penurunan tidak resmi, sebelum tujuan akhir). Sebagai contoh, bus Damri yang ke Rawamangun biasanya menurunkan penumpang di Rawasari. Cara paling mudah adalah menanyakan langsung ke kondektur bus Damri tersebut. Semoga informasinya membantu. Can you please advise on the best mode of transport to the hotel. I think taxi will be the best option. Taxiku or Blue Bird are both good companies to use. Thanks Firsta for the information. What could be the approximate taxi fare and journey time during this time (4PM on Friday) from airport to Hotel. I have a few questions. Our plane arrives at 6:10 pm, and the train departs at 8:45pm from Gambri. Is taking a TAXI a faster option than DAMRI bus? What is a normal price for a taxi ride from the airport to Gambri? How long does it takes to get from the airport to Gambri station? There are three of us, so I assume we will only need 1 taxi car. A taxi is quicker than the bus. With the traffic the journey can take anything from 1-2 hours. You’d only need one taxi. Hello Frista! you look very kind and available answering all question about java! Me and my girlfriend are just arrived in jakarta and we would like to move to Pangandaran tomorrow . We red online from others blog about the direct bus from kampung rangutan terminal, but we can’t find any time schedule and we don’t know when to get there!because it’s pretty far away from where we are staying at night we would like to have an idea on when to get there and don’t spend all day long waiting for the direct bus.Do you have any suggestions? Or any other options to get to pangandaran? Thanks you in advance for your time! There is a Damri bus from Airport (CGK) to Mangga Dua. 🙂 It is Rp 40,000 one way per person. Hi Pat. You can take the bus direct to Gambir station if you want. That is the cheapest option. A taxi is more expensive, but more convenient. Ah, I see. I’m staying at Big Hotel. So after alighting at Gambir how do i proceed? I’d like to know Damri Bus’Time table,especially a first depart time of Damri Bus which go from Jakarta airport to Gambir. Hi Joonsup Chang, Thanks for stopping by on my blog. Perhaps around 06:00 am. Thank you for stopping by here. You should take the one to Kp. Rambutan (Kampung Rambutan). I think it should stop somewhere near Taman Mini Indonesia Indah (TMII). Please ask to the Damri ticket counter to make sure. 🙂 Have a great time exploring Jakarta. Thank you for stopping by here. I don’t know the taxi fare from the airport to Mangga Dua. Probably around Rp 200,000-250,000. Not sure. Just pick Blue Bird or Express or Gamya. They are reliable taxi companies. Have a great time in Jakarta. Not too sure about the taxi rate from Jakarta to Bekasi (for 9 people). 🙁 Sorry can’t help. To get taxi from the airport just simply go to the taxi counter. I recommend Blue bird and express taxi. I will be visiting Jakarta on 31st March till 4th April this year. This will be my first time and I am traveling with 3 others. Appreciate if you could suggest the best area to stay for easy transport, shopping and food. May I have a copy of the same details , please. Me, too, please, Firsta. I will be arriving very late on the 12th. The bus will not go at that time, right? Could you recommend somebody who could show me around? I will be staying some days. So sorry for the late reply. I was having a limited internet connection for the last 3-4 days. I hope you are enjoying your time in Jakarta. i think that I will have discovered most for the time and fly to Malaysia’s Chinese New Year celebrations tomorrow. But will come back in a week to explore more! i am going to jakarta very soon. I want to take Damri Bus to my hotel. 1. Where to begin ? 2. Where to drop ( which station) ? 3.How to continue to my hotel? 4. What will be the fare? 5.What is the taxi rate instead? 6.How long is the journey? Is there alternatives to Taxi and Bus, like trains or Metro to my hotel ? 1. Where to begin ? – the Damri shelter. 2. Where to drop ( which station) ? – I think GAMBIR. 4. What will be the fare? – It is stated on the article. 6.How long is the journey? – Depends the traffic 😀 It can be 1 hour, can be 2 hours. Is there alternatives to Taxi and Bus, like trains or Metro to my hotel ? – No. Trains and Metro from/to the airport is not (yet) available at the moment. I arrived today, Wednesday 17th of Feb , at 4PM. Your guidance was very helpful. and he did, as it is the usual practice for him. I paid a visit to Holiday Inn Express Thamrin and Artotel Thamrin. They are far better than the millennium where I am staying. ARTOtel was offering picking up at the Airport,Breakfast,extra meal ( Lunch or Dinner),1 hour massage and drop at the Airport with less room charge. Kindly tell me where to go for some places of OLD heritage Jakarta. Somebody told me about KOTA.Any places else . Finally, I will be leaving to Bogor after 2 days. Please tell me how to get there budget wise. Can I chat with you over the WhatsApp ? If yes, please send me your number. Once more thank you very much, you are great. Yes Kota Tua is a great place to explore if you are looking for Old Heritage Jakarta. You can easily go to Bogor with the train (commuterline). Can’t remember the ticket price, it should be less than USD 1. Apologies, I am not doing Whatsapp chat for my blog purposes. Feel free to get in touch via comment box (here on my blog). I’ll try my best to reply. Have a great time in Jakarta. I intend to go to Indonesia few weeks later with my family and it is the first time for me, so I need some help . Thanks for stopping by here. What kind of info that you need? Looking forward for my 2nd visit to Jakarta soon! Just wondering, my parents are about to touchdown in CGK at 10 am & is it possible for them to catch the train in Gambir to Bandung scheduled at 12.45pm? Hi Falina. Yes it would be possible for your parents to catch the train. Will have to make a video next time I go through Jakarta airport to show exactly where the Damri bus leaves from. It’s easy to miss it when leaving the airport if it’s your first time there.. I am planning a trip as solo traveler to Jakarta next March. I will not be arriving into the airport until after 7pm and will probably arrange transport. On my return I would like to save some money and take the Damri from Gambir. I need to know where exactly is this located….near the National Museum? Tried to find it on a map. Please give me some direction and I will keep in touch with my questions. Your assistance seems to be invaluable. Hi Glo. The Damri bus station is at the back of Gambir train station. If you ask at the train station people will direct you to the buses. Thank you. I just thought about another option. I am a young senior but a pretty bold traveler, but I think I will stay near the airport the first night. The rates may be pretty good because most people want the city. The next day I will then travel to Kunnigan where the hotel is….not definite yet on which hotel right now in the city. Then I will take the bus. I think it is better to go to the city on the first night, that will allow you to do city exploration in the morning. But if you are thinking to stay near the airport for the first night, please check this article: https://discoveryourindonesia.com/hotels-near-jakarta-airport/. Hope it helps. I did some more checking today after confirming my flight and I want to ask you about a few hotels in the Gambir area. Do you know anything about the G7 Hotel and MaxOne Hotel @ Sabang. I was booked at the new hotel in Ayaka Suites in Kunnegan??. I thought maybe I would spend the first night at the Gambir location…..let them keep my bags after check out. Wonder around that area for museum, etc then head to the Kunnegan area to see that side of town. I don’t have but 2 1/2 days there before going on to Colombo. What you think about this and the hotels mentioned? We are 3 of us planing to come to jakartha for 3 day visit. 2. What are the budget hotels that we can stay. 3. What are the places we can see and how can we arrange it. I have finalized all my plans to Jakarta and my routing from airport. Thank you so much for your information. I found a great place to stay and now I have a traveling friend…so this will be a great trip. I like the West side of the city…did not want to be smack in the mist. I hope you tell the Dish there are a lot of budget hotels…but to be careful where they get one at. I have been good at using mapquest to take walks through the streets and back streets….boy it is so nice to be able to see locations online. Anyway, thanks and if you have someone who is looking for a luxury apartment…they can leave a message here and I will tell them. Firstly thank you so much for this informative website and thank you for being so responsive and helpful. God bless you! 1. From what I read from all the comments above, the cheapest way from the Airport is by Damri Bus to Gambir and take ojek to your hotel nearby Tanah Abang (Thamrin). Now can both transportation accommodate huge luggage? 2. What is your recommendation to travel to Puncak or Bogor from Tanah Abang budget wise? Again take into consideration my HUGE luggage. 3. Cheapest hotel/motel/air bnb nearby Tanah Abang walking distance, if you can recommend any? Okay I think that’s all for now hehe. I definitely ask more when I have questions bugging my mind. Damri can accommodate a big luggage while Ojek is not possible. By Commuter Line (the train) is the easiest and cheapest, though I am not sure if they have certain rules regarding luggage. Sorry don’t really have recommendation for cheap hotel near Tanah Abang. Have a great trip in Indonesia. Planning to experience the beautiful lanskap via train. Seeking your advice on transportation to gambir train station. Not sure either taking bus or taxi to gambir station. And from bandung would like to take bus..can advise me type of bus? By d way my flight from jakarta to kuala lumpur around 6pm. As I stated in this article, you can take a Damri bus from the airport to Gambir train station. It cost Rp 40,000 x 4 = Rp 160,000. A taxi might cost you a tiny bit more expensive, around Rp 175,000 – Rp 225,000 (obviously depends on the traffic). Apologies I don’t know about bus from Bandung to Jakarta. There are several minibus (we call it “Travel”), like: DayTrans. I think it cost around Rp 100,000 per person. Hope it helps. There are 5 of us coming to Jakarta for 3 day visit in Aug. Most of us are foodie craze, would like to know where is the best place in town to have authentic local food let it be stall or restuarant. Is Gambir the city centre? Are the museums also within the area? It’s my first time in Jakarta and I will be there for two days. What can I do to maximize it? Thank you! Yes, Gambir is in the city center area. It is close to some museums (close to National Monument, Istiqlal Mosque as well) and easy access to Old town (with train from Gambir to Kota) or with TransJakarta bus. 1. Is it safe for me to walk from Gambir bus terminal / station to the hotel? 2. I have the perception that bus / train terminus are usually very chaotic and just like to check if is it safe for a young guy (who’s traveling alone) to alight from there and walk over to the hotel. 3. Would you recommend taking a taxi / private transport instead (i’m worried about being cheated and being driven to a different location). Hi Ian. The bus station is a bit chaotic, but it’s fine to walk to your hotel. You can also take a taxi if you want, as long as you have one with a meter they won’t cheat you. I’d recommend Blue Bird or Taxi Ku. Or download the Gojek app, which is very convenient for Jakarta. Is there a Damri bus from Soekarno Hatta airport to Tang city in Tangerang or somewhere close by ? Hi Teo. Yes there is a bus from Soekarno Hatta to Tangerang (it’s a district of Jakarta). Just ask at the counter. i enjoy reading your blog. it is very helpful. my family and i are planning to visit jakarta in two weeks time. we will be staying at holiday inn kemayoran. if we take the damri bas, do we alight at mangga dua or blok m or gambir then proceed with taxi? which is nearer. or would you know the approx taxi fare from the airport? Hi Zarina. A taxi would cost between Rp 150,000 and Rp 300,000. I would recommend a taxi if you are a group of 4 or more. There is a bus to Kemayoran. It costs Rp 40,000 per person. My apt is Thamrin Executive Resident, Jalan Kebon Kacang Raya ,Central Jakarta. Which Damri bus should I take from airport ? I heard one of the bus stops in front of this building. I’d advise taking the bus to Thamrin. From there you can get a taxi or Gojek to the apartment. We are arriving 5 am in the morning at the CGK airport, is there Damri bus at that time to Ibis Styles Mangga Dua Square? How much is Taxi or does Uber work at the airport? Thanks. A Taxi will probably cost you Rp 100,000 or more to Mangga Dua. The airport is a bit far out of town for Uber. 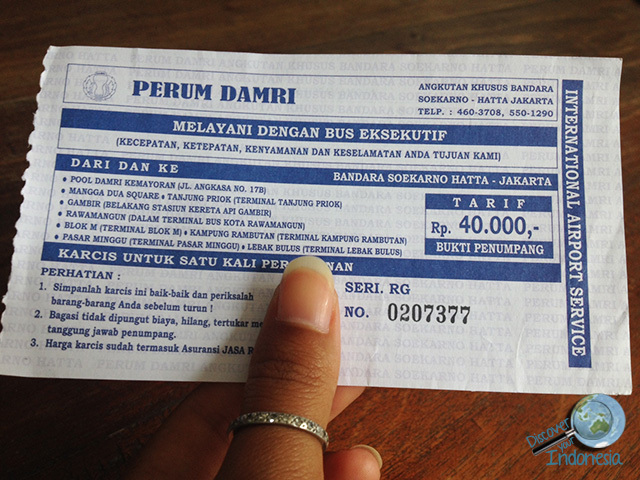 With the Damri Bus it costs Rp 40,000 per person. You can actually find the info in the article. Probably around 1-1,5 hours (depend on the traffic). I’ll be staying in the Grand Mercure Kemayoran. Is there a taxi or public transport from the Kemayoran Bus Depot or is it fine to walk there? Sorry can’t help because I never go there. Maybe you can ask at the Damri counter / the Damri bus driver. I would to go to community market to buy betta fish (address: jalan ks tubun no.3 dalam rt 001/04 no.39 slipi west jakarta barat). I am staying at tomang residence jl. Kamboja 35, 11430 jakarta from 15-18aug.16. How can i go there by tax . Thanks again. You can use Blue Bird taxi / Express taxi, or can simply download Uber / Grab app. All the best! hi i am also 1 of all above traveling for the 1st time to jakarta, i had booked Hotel Mercure jakarta kota for 1 week in august worried if is it the good 1 or not. want to stay in budget hotel in central jakarta near malls. Not sure if Mercure is a budget hotel, I think it is a midrange. Always check trip advisor for the rating and comments. This is the best way to find out if you are staying at a good place or not. Is there possibility to take the metro or subway from Jakarta Internationa airport to the Mercure HotelSimatupang in Jakarta South? Hi Shaun. Yes it is possible. Can you exchange currency at the airport or have atm? Best transportation option to North Jakarta? how much is the cost for 1day car rental with driver. i plan to book for 1day on 9aug, pickup 0900am from thamrin city and bring us around jakarta for 1day and send us back to the airport at 1800hrs. please advise cost includes driver, petrol and toll to the airport. Hi Yati. Thanks for getting in touch. You can find the price for the Jakarta car rental here. The easiest and fastest Azim is probably Gojek, which is a motorbike taxi app. I will be coming to Jakarta with a friend next week for a day and later go for Bali. We will be staying at ‘The Cipta Hotel’ in Jalan Jaksa. Could you please me the cheapest way and convient way from the airport to jalan jaksa for 2 people? Our flight lands at the 1:30pm. Also, what could be done and seen in Jakarta in 24hours? Hi Rizwan. I would recommend taking the Damri bus to Gambir. Me coming from India via Bangkok to Jakarta on 7th September 2016.I want to Go to Pasar Bahu Are to Sikh Temple called Gurdwara Sahib.Guide me how to get cheapest transportation.Any Bus or Train . Hi Pritpal. I would recommend taking the bus. You can ask at the bus counter outside the airport regarding which bus you should take. The best way is to take a taxi, you can choose between Blue Bird, Gamya or Express Taxi. Apologies it has been a while I didn’t go to Jakarta, I don’t know exactly how much does it cost. Perhaps between Rp 150,000 – Rp 200,000. Have a great trip to Indonesia. I will arrive in terminal 2 at 13.30 and will continue my flight from terminal 1 to catch a flight at 17.00. Im thinking of taking a taxi, will the taxi driver take me on such a short distance? How long does it take from terminal 2 to terminal 1 by taxi? How much? Do i have enough time to eat bakmi gm at terminal 2? thanks. Yes, the Taxi should be able to take you the short distance. Btw, there is a free shuttle service between terminals (the bus is yellow). As long as it doesn’t take a long time to collect your luggage, you should be fine to eat Bakmi GM first before moving to Terminal 1. Sorry, don’t know how much the taxi costs. All the best. Hi! Thank you for this useful article. We will be in Jakarta soon and staying at the Ibis hotel close to the airport. We would like to catch the 8 or 8:50am train from Gambir station to Yogyakarta but I’m afraid we won’t arrive at Gambir on time with the Damri bus. Any idea when the first one leaves the airport in the morning? Or do you have any suggestion on how we should get to the station from our hotel? Hi Greg, the Damri bus to the airport start around 4 AM, so I think from the airport to Gambir is available from 5 AM. To be safe and simple, just take a taxi from your hotel. 🙂 You don’t need to go to the airport first to catch the Damri bus. HI, MY Wife and I are leaving for Jakarta on 21st September 2016 . Our flight will arrive at Jakarta around 4pm. We intend to go straight to Bandung for a couple of days. Can you advise me how to go on a budget trip. We will put up a night on 25th September 2016 as our flight back to K>L. is on the 26th. Appreciate if you can guide me on the above. From the airport Jakarta, you can go to Gambir train station with the Damri bus and get a train from Gambir to Bandung (need to pre book the tickets). If you can ride a scooter, perhaps renting a scooter in Bandung or go to places with the public transport (Angkot) can be a good way to do a budget trip. please advise me on my request from your end. Any good budget hotel in Jakarta and what to do in Jakarta. Unfortunately I don’t have that much knowledge about Bandung. I don’t have a list about good budget hotel in Jakarta, I only have best 5 star hotel in Jakarta list. Check this article for inspiration on things to do in Jakarta: To do in Jakarta. When I took Bluebird cab from CGK to my hotel, the driver demanded extra 10,000 R for airport surcharge when I pay. What is the surcharge about ? Do I have to pay ? Hi Quang, I am not sure what is the surcharge is for, but it is their policy/mandatory. Hi Quang, i guess this is the amount the taxis pay to park at the airport. I will be coming to Jakarta with my family (2 adult. 2 child) . Anyway we going to Bogor, I can’t find Damri bus time schedule. What time is the last bus to bogor. Damri bus (to Jakarta area) is available until 11 PM. There is a Damri bus to Bogor, but I am not sure about the schedule. I am assuming they will still be available until 09:00 PM. All the best for your travels. I am not sure. :/ Probably go to Gambir (by Damri) and go from Gambir to Pasar Minggu (by train). Could I buy domestic air ticket from Jakarta to Bali at CGK when I arrive and fly right after that? You can do, but there’s always the chance it will be sold out. I’d recommend buying the ticket before to be safe. I don’t think you can buy it at the airport. You can buy online though using your laptop / mobile. firstly thanks for this information. I would like to travel cheapest way possible haha, so according to this writing, I should take the bus to Gambir, yes? I need to go to Jakarta near Plaza Senayan, FX Mall sudirman. so from Gambir, is there a bus or train to go to the place? Thank you for your help! Hi Radz. Glad you found the information useful. You can catch a taxi from Gambir to the Trans Jakarta and then take the Trans Jakarta to FX Mall. Hope that helps. I am visiting Jakarta on December 1st week. How can I go to Jakarta to Bandung? What is the time duration and travel distance please? It is around 160 KM. You can go by minibus (I think you’ll be able to find it from Jakarta’s airport) or by train. The duration around 2-3 hours. Get the Damri bus to Gambir and you can get a motorbike taxi / taxi from Gambir to Menteng. Good luck! Hi. I am planning a virgin trip for me, hubby and our 9 years old boy to Jakarta this March. Not to sure what we should look out as a family adventure as well as accomodation and shopping. what are your advise on this? Thank you. You can visit the old town (Kota Tua), Jalan Surabaya, and explore around Thamrin area for shopping (two malls: Grand Indonesia, Plaza Indonesia, and Thamrin city and also not very far from Tanah Abang the textile market). For accommodation, I personally like Cikini-Sabang area, please also check this article for more info about Jakarta. may i know what kind of taxi i can take from jakarta airport to Bogor Cisarua Puncak if arrive airport 10pm? pls adv. Hi Fizah, I’d advise arranging a car rental or maybe trying with Uber. A metered taxi will be very expensive given the distance you’ll be travelling. First of all, I LOVE your blog! It has so many valuable information. Do you know if it is safe to take Uber from the airport to the hostel? We are landing after midnight and I saw Uber is pretty cheap. What transportation option do you suggest for travelers arriving after midnight? Hi firsta…i really love reading ur blog as it gives a lot of information.. I am planning a trip to go yogyakarta this october..so can you give me some suggestions on the cheapest way to go to yogya from seokarno hatta airport instead of taking the plane?? Hi Maya, probably taking the economy train or bus (I never try bus). However, also check the business class train ticket price as they usually not that expensive and it is really convenient to transfer Jakarta airport – Gambir station (using Damri bus). Business and Executive trains depart from Gambir train station, Economy train departs from Senen / Jatinegara train station. All the best! Sorry for the late reply. Not sure where Margo hotel is. Is it in Depok? Probably order a taxi: Blue Bird. Hello Firsta; found your blog very informative and helpful. I am travelling Jakarta in 2nd week of March and will take a return flight on 19th March. I have some tight schedule ; after finishing my work at Lippo Village, Klp. Dua, Tangerang, Banten at around 4:30- 5:00 PM ; what will be best option to reach airport by 6 PM ? That is tight timing. Maybe you can get a motorbike taxi or a taxi. All the best! Hi, Firsta. How much roughly will it cost to take a taxi from Gambir to Thamrin? Thanks. I am planning to go to Jakarta @ December for my family trip for 5D4N. My major intention just for sightseeing, eating around…. will go to Jakarta Zoo as will. What is your suggestion for me to book the Hotel, which area is more convenient for us? Is public transportation is easy for 5 of us? For a group of 5 people, it is easier to rent a car rather than use the public transport. I personally love Thamrin, Cikini area. Thank you Firsta for your reply. Unfortunately I don’t have any recommendation in regards to car rental. Try to arrange it through your hotel maybe? I found a Hotel located at Jalan Bungur Besar Raya, is it ok? I am sure it should be ok. It is in Kemayoran area and usually the traffic quite bad (but the traffic in Jakarta everywhere is more or less the same). Just check the tourist attractions that you would like to visit and find a hotel where it is strategically located in the middle of it. Have a great time in Jakarta. Next month I’ll go to jakarta and hope to visit Yogyakarta by train, please tell me is possible to buy a train ticket just before 48 hours departure time. Anyhow thanks again for your reply ….. I am glad to hear that you got your flight ticket ok. Yes, I’ve heard several times that the train ticket website doesn’t accept some foreign cards. Hi Udaya, I am glad to know that you got your flight ticket ok. Yes, I have heard that the train ticket website doesn’t accept some foreign cards. Arrived at CGK on the 19th of May 2017 without doing my home work and went to the taxi dispatch desk(called blue taxi) immediately outside arrivals terminal 2.They charged me Rp400,000 to go to Sabang central Jakarta fixed rate but clearly at least twice the going rate,so be warned.During my stay used Blue Bird taxi’s and found that they were best value for money. Hi Trevor. I’m sad to hear you had those problems. It’s always best to get a taxi from the waiting area outside of the airport as these are on a meter with a small additional charge based on area (normally around Rp 200,000 for anywhere in Jakarta). need your advise as i ll be travelling to jakarta soon for buy some soccer cleats for a reasonable price. what is the best area to stay? Sorry I don’t know where you can get soccer cleats with a good price. Umm.. maybe Mangga Dua? You can stay at Mangga Dua or Kemayoran area. Wish you a great trip in Indonesia. sorry to bother you again, can i have your whatsapp or viber number please? No. Apologies, I only use my personal number for family and close friends. You can send us an email or comment through the blog if you have any questions. Hope you have a great time in Indonesia. That is sweet of you! I think there is a Damri bus from the airport to Lebak Bulus area, which is really close to Cilandak. From Lebak Bulus (I’m assuming the last stop is at the bus terminal), you can get a taxi/Uber/Grab. It should be easy. All the best for your travels and hope you have a great time in Jakarta. I am sure there is a Damri bus from the airport to Karawaci. Not sure where the (last) stop for it is, but it should be easy to catch. You can ask the lady at the counter/the bus driver. Good luck! Thank you! I’ll try that, I’m sure I can do it 😀 thanks! Your blog is really helpful for firs timer traveling to Jakarta. We’re planning to go to Jakarta in September and will be staying at an apartment in Kalibata. There’ll be 3 of us and would it be better for us to take the Damri Bus or the BlueBird Taxi, upon our arrival? If Damri bus is the choice, could you inform us where do we stop to get to the Kalibata Apartment? If you are a group of 3, then it is better to get a taxi. Blue Bird is one the best taxis. A taxi should cost around Rp 160,000-ish (include the toll fee). Damri Bus cost Rp 40,000 per person and you might need a taxi to go from the bus stop to the apartment. Have a great time in Jakarta! Your suggestions & advise very helpful to me.Lots of Thanks. I had already visited Jakarta & prefferes Damri Bus as i was Alone. Thank you so much for your helpful site. Especially for travellers coming to Indonesia for the first time it is very helpful! So am I.. I plan to visit Java end of October/November. I read on an Indonesia Expat site that the train to Jakarta should be available as of mid July 2017. Can you confirm if it is already running and if this is a better option than bus or taxi? Cause I can’t find any posts on the internet if the railway is already operational. Thanks a lot again and regards from the Netherlands. The train is not yet available. I heard the airport train will be available either in November or December. Thank you for your reply Firsta ! We’ll be flying to Jakarta next week. Your information is very helpful, but I wonder if it is still like this! I am going to land in Jakarta the 28th of october at 6pm, but would like to go to Bandung the same day. There is a train from Gambir at 8pm and I wonder if it’s possible to make it in time if I take the damri bus around 7pm to the station.. thanks in advance! It is a bit difficult to reach Gambir from the airport in 1 hour. 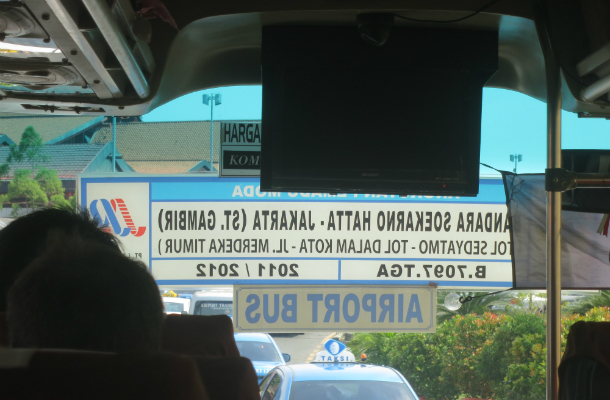 There is a shuttle bus/travel (mini bus) from the airport to Bandung. Hope you have a nice trip in Indonesia. I think the cost is still the same. You can go to the old town (Kota Tua), Mangga Dua area for shopping and the Monas (National Monument) area. Yeah train is ok, just avoid the peak hours. Hope you have a great time exploring Jakarta. Thank you so much for this post. Thanks to you my first solo travel adventure started stress free. I arrived at the airport, followed your guidelines and got to my hostel in a budget friendly way (I took the Damri bus). I’m working on a travel blog myself and would love to link back to this amazing post if you don’t mind. Everyone how wants to travel budget friendly to Jakarta should read this! My blog isn’t online yet, but I’ll make sure to send you the url once it’s up in the air. I am happy to hear that you had a stress free start to your adventure. Sure feel free to link to my post if you find it useful. We will go to Jakarta next month. We are group of 5. What type of transportation suits for us to get from the Soekarno Hatta airport to Thamrin? Hi Zetty, for a group of 5 it is better to get a taxi 🙂 You can use Silver Bird (by Blue Bird)/Tiara Taxi (by Express). Have a great time in Jakarta. Is the expo held in Kemayoran area or Senayan area? How about Uber? I was reading about UberX and UberMOTOR in Jakarta. Yes there is that option too. Previously the online booking/reservation vehicles are prohibited to operate at the airport, but now it is possible. Hi, I am going to jakarta on 16 Dec 2017 just after 2 days. I am going to stay at thamrin, may you tell me please, how much it will take by blue bird taxi from CGK airport including all toll fees at the morning? Sorry for the late reply. Hope you enjoyed your time in Jakarta. Hi Norj, if you are a group of 3 people, just get a taxi. If you are alone or two people, then get the Damri bus to Gambir and you can walk a tiny bit to get the Trans Jakarta bus that goes to Thamrin (Plaza Indonesia area). Btw, they just recently open the train to/from the airport to the city center. I don’t know how much does it cost, but it should be a convenient way to reach the town (as you won’t get the traffic). Have a great time in Indonesia. Hi! Your blog is very helpful! I read what you wrote about the train to/from the city center. I’m flying in from Jogja so I’m guessing I’ll be at Terminal 3. Can I already take the train? Also, is it true that Uber can pick you up at Terminal 3 or is the pick up area far from the airport? I think you can order Uber from the airport, it is not a problem now. Please read this article to find out more about it. In regards to the train, do you mean the Sky Train? I think now you can access it from all terminals (1,2 and 3). When I tried it, it was from Terminal 2. All the best for your travels. This is very helpful, I am from the Philippines and I will be visiting in Jakarta this coming August. I am so excited to explore the capital and will get to visit historical landmarks and meet hopefully new friends there. Yes as far as I know you can’t pay cash, you have to use debit/credit card or e-money (if you buy the ticket on the spot). You can also buy it online through this website: https://reservation.railink.co.id/. Hope this helps and have a great time in Indonesia. Can you please advise us how to go to Taman Mini Indonesia Indah from the Airport please? I think you can take the Damri bus to Kampung Rambutan and ask them to drop you off at the closest point to Taman Mini. You have to walk a little bit. Thank you for your travel blog as I found it very informative. I am travelling to Jakarta with my wife and two young children. We will arrive on 28 April 2018 and will head to Depok and will stay near Margo City Mall. Can you suggest the best way to get to Depok? We are unsure if we should hire a driver or catch a taxi and how much this costs? Thank you for getting in touch. If you are a number of 4 people, it is better to get a taxi. If you can arrange a pick up service from your hotel that is great option too I guess. Not sure about the rate since I haven’t visited Depok recently. Hi, thank you for sharing this article with us. My friend and I will be arriving at Soekarno-Hatta International Airport around 06:30 on a Friday in June. Around 20:00, we have our next flight to our final destination. We would love to visit some place in Indonesia close to the airport. What would you recommend? I heard from multiple people the traffic around Jakarta is terrible, so that wouldn’t be really an option for us I guess? What can we do during this day, i.e. what would you recommend? Thank you! What date in June? and is it 6:30 am or pm? I guess it is 6:30 am right? I think you have enough time to visit some places in Jakarta if you are arriving at 6:30 am and your next departure is 8 pm. You can also use the train back to the airport, or get a taxi if the traffic is ok.
PS: If it is the week 11-18 June, you are lucky! Jakarta will be ’empty’ because a lot of people go to their hometown to celebrate Idul Fitri. Safe travels. I have connecting flight in Jakarta. I will arrive 1AM and my next flight leaves 11AM in the morning. Where is a good place to stay to kill time or have a good breakfast near the airport where I can take a glimpse of Jakarta. I am not too sure to be honest.. There are a few of midnight food stalls but they usually close at 2 AM. A lot of places (good restaurants/cafe) open at 7-8 AM. I don’t think you can get back in time for your flight at 11 AM, assuming you have to be at the airport at 10 AM. Hi. Thanks alot for the elaborate discription of how to get to hotels etc. It is very helpful. Just curious about a few things if u can help me out. I have almost 6 nights in indonesia. Planning 3 in Bali. U recommend 3 in jakarta or should I go for yogya? Last thing. My hostel is offering a ride for 190 idr. Looks like a fair price to you for north jakarta. I would recommend to go to Yogyakarta 🙂 It’s one of my favourite destinations in Indonesia. 190rb sounds ok, just a tiny bit expensive. If you are a group more than 2 people I think it is ok 🙂 Have a great fun! hi Firsta, i’m going alone to bekasi from CGK. 1. which is best transport option that is cheap, reliable and most importantly safety. is there really damia bus to bekasi from CGK? 2. do u know any construction site in bekasi city which is developing a commercial building? if u dont know, can u suggest where i can get the info? Apologies for the late reply. Yes there is Damri bus from CGK to Bekasi. Please make sure which area of Bekasi that you are going to. They usually have East Bekasi and West Bekasi. About your second question, I’m sorry I don’t know about it. firsta saya bakal ke jakarta pada tanggal 31 August 2018 jam 11.30 pm. dari Malaysia. Blog anda sangat membantu. nnt saya kongsikan pengalaman saya menaiki DAMRI and explore jakarta. ini merupakan pertama kali saya ke jakarta dan secara sendiri. Ojek itu boleh di access di Airport atau tidak? Terima kasih atas pesannya. Saya belum pernah naik ojek dari bandara jadi saya tidka tahu apakah bisa access atau tidak. Probably it is possible for drop off but not for pick up. I’m not sure..
I’m from Philippines and it will be my first time in Indonesia. I’ll arrive at CGK on October 22, 2018 at 23:40 P.M.
You can easily open tiket. com or traveloka. com. You can check this article to learn more about it. There are hotels at CGK airport. There is a capsule hotel that is good for a single traveller. Have a great time in Indonesia. Yes, I’ve already read it and it’s so helpful especially for first timers. Thankyou 😊 and about your currency, which is better? To change my PH peso to USD here in philippines, then change it to RPH when I arrive there, or just bring my PH peso and change to RPH right away? Hi, great article and wonder if you can help me? Does the train stop anywhere near the tourist backpacker area? I am having real issues finding the train stops in the city! I once took a cab from the airport and it was over 3 hours! Never again. I have actually avoided visiting Jakarta because of this experience. Hi, you can take the Damri bus to Gambir. Actually the article talked about it. From the airport to Backpacker area such as Jalan Jaksa/Sabang area or Cikini area. Thanks a lot for your information which I found very useful. I am flying to GCK in December and looking forward to catch the Damri bus to Gambir station. I understand your article is written in 2013. Kindly confirm if this Gambir service still runs every half an hour. If not, how often does it run? Hi Sriyani, yes it is still more or less the same. Sometimes you only need wait 20 minutes, sometimes you need to wait a bit longer and sometimes your bus is just there (perfect timing!). Thanks for your quick reply Firsta. Kindly let me know I it is a air conditioned bus. I am moving to Jakarta Jan (5th) and I am wondering what the cheapest way is to Jalan Jenderal Sudirman Kav. 58, RT.5/RW.3, Senayan. Hi Marte, the cheapest way is using the Damri bus and then get a taxi from there. You can also get the train to BNI City Station and get a taxi from there, it is around 6-7 km only from the station to your address. Great article and lots of useful information. I am leaving for Jakarta this coming Friday, 18th of January. I am going to Kelapa Gading area which is north Jakarta. What do you recommend is the best way to get there? Cheapest is better but fastest is equally important as well. I am getting in to CGK around 3 pm. Your help is very much appreciated. Thanks in advance and thank you for putting up a helpful information for people visiting your country. I’m sorry for the late reply. How was it? I think taxi is the best option to reach Kelapa Gading area. My Father is working at Jakarta! He always inviting me to travel to indonesia Jakarta . He like to to visit there! HOpefully this may I go there. Just like to get your comment on our late arrival on 22/2, expected time of arrival is around midnight (+23/2). For surely the airport train has stop operating by the time of our arrival. And of course the only option we have is by Taxi. We would like to know, how much will it cost for trip to Thamrin City from the airport. Appreciate your kind comments on the above, please. A taxi might cost around Rp 175,000. Get Blue Bird or Express Taxi, they do have meter in the taxi. You have to pay for the surcharge cost and the toll fee too. Hope you have a great time in Indonesia. Thank you so much for your kind comments and surely will have good time in Jakarta. I’m coming to Jakarta this coming Friday and it’s my first time going to Kuningan city. I’ll be using AirAsia so obviously I’ll be landing at CGK. As a first timer, reading your article helped me to chill a bit since I was anxious on types of transportation available from CGK. But still, any advice on which transport I should take? Well, to be honest I planned on taking a taxi since I’m traveling with my mother. Do you know the estimation for taxi price from CGK to Kuningan city? Sorry for the late reply. If you are going to Kuningan City, I think it is better to take a taxi as it is straightforward. You can also take the train from the airport to BNI Baru station (nearby/around Sudirman) then take a taxi from there (Sudirman to Kuningan City is quite close). Good luck! Have a great time in Indonesia. Hello. Please help me. I’m going to Yogyakarta via train this March 5 to 7. I’ll be arriving in Jakarta by 12am March 5. It’s my first time to visit Indonesia. From Jakarta airport to Gambir station via bus, how long is the travel? Gambir bus station and Gambir train station is the same place? 12am means 12 midnight? The journey from the airport to Gambir is around 45 mins to 1,5 hours. Gambir is a train station, there is no bus station there, but the Damri bus goes to Gambir station (this means the train station). Yes, it’s 12 midnight. Does the Damru bus operates 24/7? If not, what time is the last bus to Gambir Station? And what time is the 1st bus to Gambir? Thank you for your answers. I am going to Jkt this April. I will be landing at CGK airport from Kuala Lumpur. I am trvelling with my family with an infant. What is the shorttest and easier way to get to the Jakarta Sentral/city? i plan to take the train as they are no chance stuck in traffic however I’m not sure if the arriving station ( Gambir/ BNI) is near the city? Thanks firsta! Hope to hear from you! Train is probably the best option considering the packed traffic. On Friday, it is a bit tricky. Traffic is usually quite heavy at after office hour time: 4-8 pm. It is usually get worse if it rains. I would suggest to stay at the same hotel for 4 nights. What is your plan in Jakarta? Are there any particular places you would like to visit? Yes, the train station BNI is at the city center, not very far from the Bunderan Hotel Indonesia (Bunderan HI) in Thamrin street. I don’t think the travel time is enough from the airport to the train station. With your arrival at 8:30 pm, I think it is not possible to arrive at Senen Train Station before 10 pm. I would recommend to pick later departure from Senen. Hi, can you please guide me the fastest (or cheapest) way to get from Soekarno airport to Blok M Square? Many thanks in advance. I think there is a Damri bus from CGK (Soekarno Hatta airport) to Blok M. I think it goes to Blok M Plaza, from there you can walk to Blok M Square.